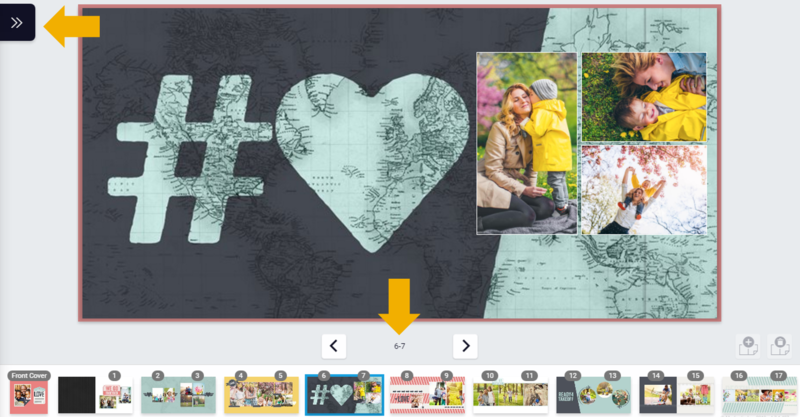 Now that you have chosen a photo book and set your options, start designing your Simple Photo Book by browsing the theme categories on the left side of the screen. Click on a theme to select it. You will now select the photos to add to your book. Albums are sorted by the year they were created. Click on a year to view its albums. Click on an album in the list, and then click on a photo. 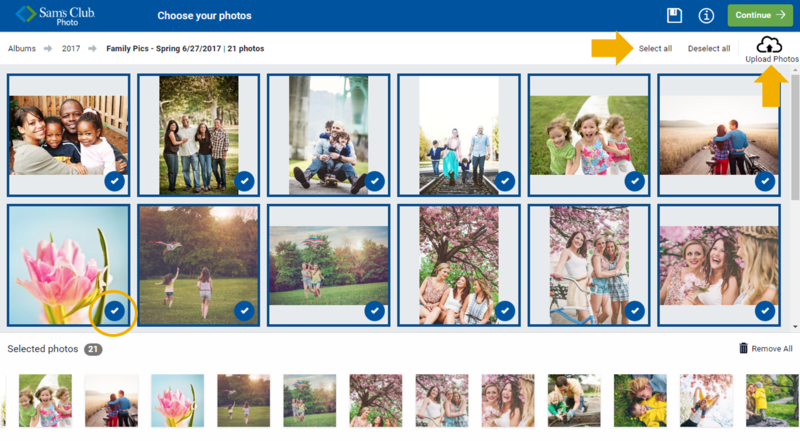 Use the Select all link in the top right to add all of the photos from the album to your book, or click Upload Photos to add new photos to your Sam's Club Photo account. Photos that have been selected will feature a blue checkmark symbol, and a small version of the photo will appear along the bottom of the screen. Use the Albums and year links in the top left to return to choose photos from other albums. 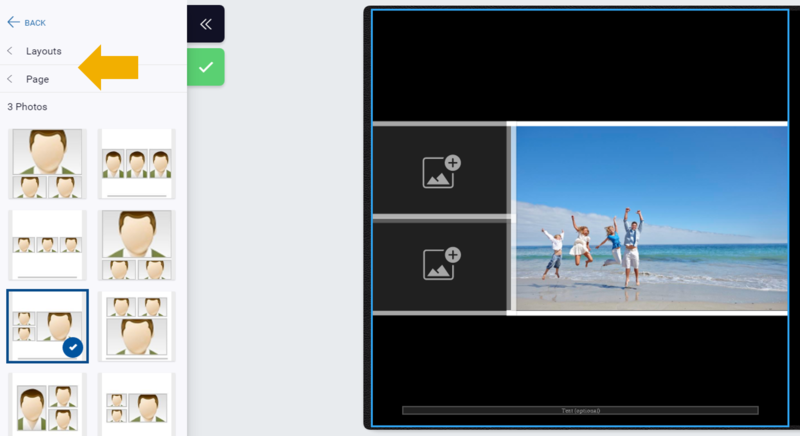 The number of photos selected is shown at the bottom, which will turn green with a checkmark when you have selected the minimum number of photos to fill your book. If you want to remove a photo from the list, click on a thumbnail and then on the blue garbage can icon that appears. To select a photo for the cover of your book or to change the order photos appear on the pages, click on a photo and then on the arrow symbol. When you are satisfied with your photos and the order in which they appear, click Continue. You can also change the order of your photos at the next step. The black double-arrow icon in the top left will open/close the customization panel. Change a photo – Click on a photo area in your book, select Photos from the panel on the left, browse through your albums and choose a photo. Photos that are already in your book will be marked with a green checkmark. Upload photos – Open the customization panel on the left, click the three-dot icon, and click Upload Photos. Learn more about uploading photos. 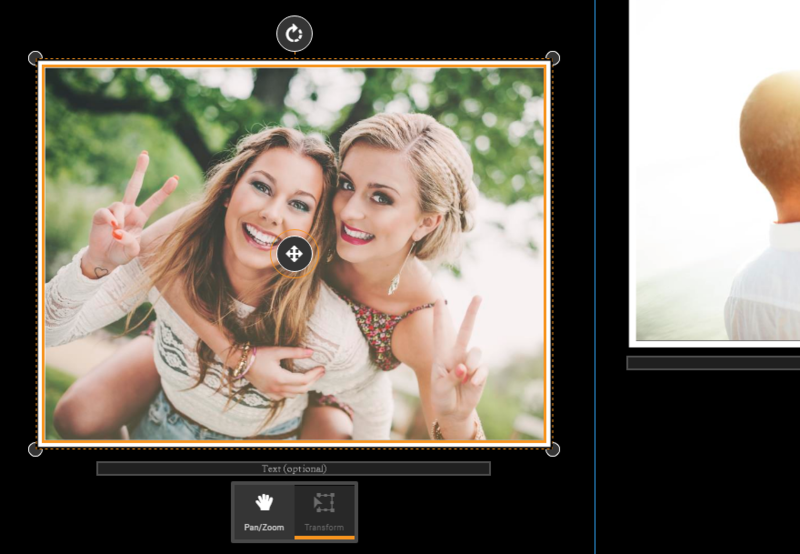 Add a photo area – Click on a page, open the customization panel on the left, and click Add new photo. Arrange the image box on the page then follow the instructions above to select a photo. Pan and zoom photos – Click on a photo in your book, then click and drag your photo to move it within its container, or scroll to zoom in/out. Transform photos – Click on a photo in your book, then click Transform. Click and drag to move the photo around the page, drag a corner to resize, or drag the rotate button to rotate. Remove a photo – Click on a photo in your book, click Transform, then drag the photo area off the page. Edit text – Click on a text box, then click Edit. 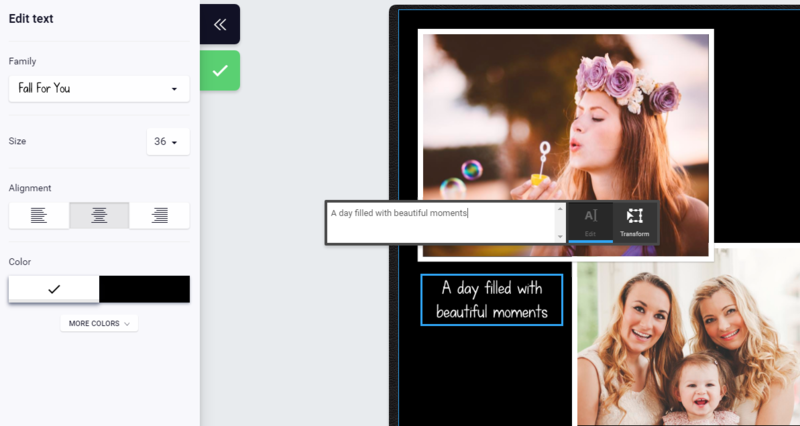 Type in your caption and format your text using the customization panel on the left. If you do not add text, the “Add text (optional)” label will not appear in your printed book. Transform text – Click on a text box in your book, then click Transform. Click and drag to move the text box around the page, drag a corner to resize, or drag the rotate button to rotate. Add a text box – Click on a page, open the customization panel on the left, and click Add new text. Arrange the text box on the page and follow the instructions above to edit the text. Remove a text box – Click on a text box in your book, click Transform, then drag the text box off the page. *Please note that the text tool does not automatically correct spelling. Change layout – Click on a page in your book and click Layouts from the panel on the left. Layouts are organized into folders. Click on a layout preview to apply it to your page. 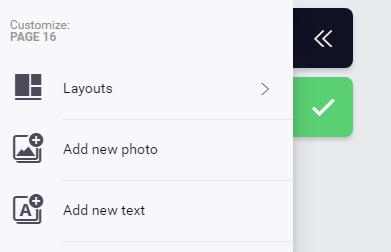 If your new layout has additional photo areas, click on one to open the photo menu and choose an additional image. Add or remove pages – Use the buttons in the bottom right corner to add or remove 2 pages. If the buttons are disabled, you have reached the minimum or maximum number of pages, or the action is not available at that part of the book. Once you are satisfied with your book, click Add to Cart. You will be asked to confirm that you have reviewed your book. Once you have verified your project, your book will be added to your shopping cart. 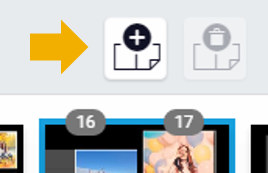 You can save your photo book project at any time by clicking the save icon in the upper right corner. To find your project later, select View Photos from the main menu and then open the Projects tab.